It appears to be a 1.0 HP unit single speed pump and plugs into a standard wall outlet. I noticed since we took ownership of the house that there is leaking coming from the pump. The previous owner from what I can see attempted to fix this with some form of heavy duty repair "tape" similar to what he patched a few holes on the pool with. You can kind of see it at the bottom of the basket behind the bucket that is used to catch the water drippings. 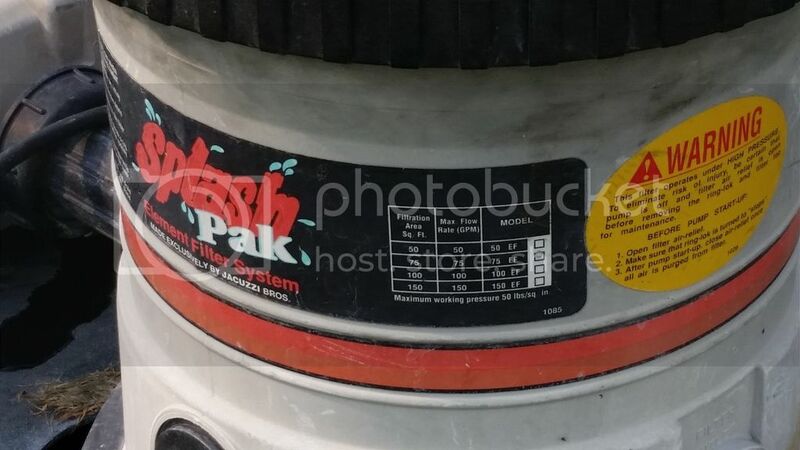 - For the spash pak system, can I use a variable speed pump that can go up to 1.5HP or is that too much for the filter setup? - Do the Jacuzzi splash pak systems have proprietary fittings such that I couldn't fit a different pump up to the system? - In general can you mount to the base different pumps are is that proprietary? 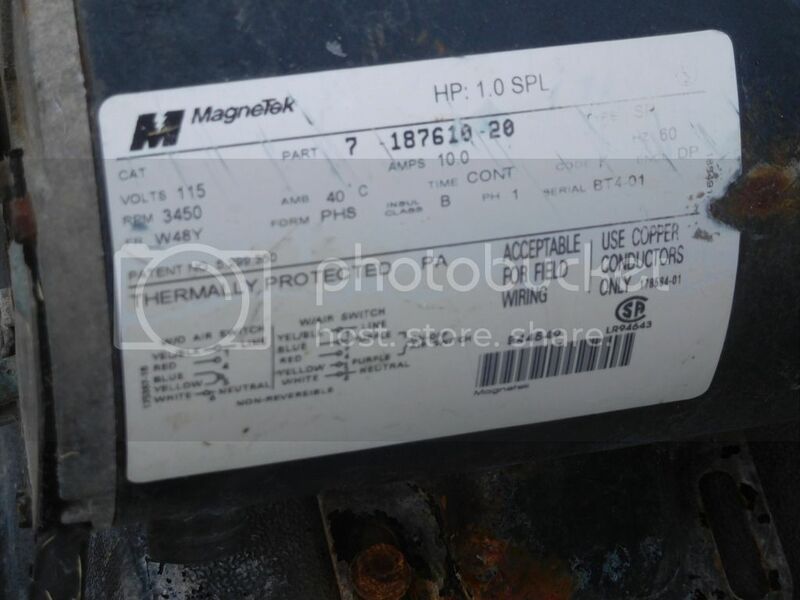 - What are things to look for to see if a motor is starting to go? Any thoughts and suggestions? I would like to get a dual speed pump if possible but stay under $225. However, if there is a pump that is just that much better for up to say $300 I could be interested. So still a bit up in the air to either buy the baskets or do a new pump. Dual speed would sure be nicer than single speed. Others will chime in, and good luck on your project there. Enjoy the summer. thanks. Still looking for any help. Hoping to place an order this week on the pump or going with a new basket. 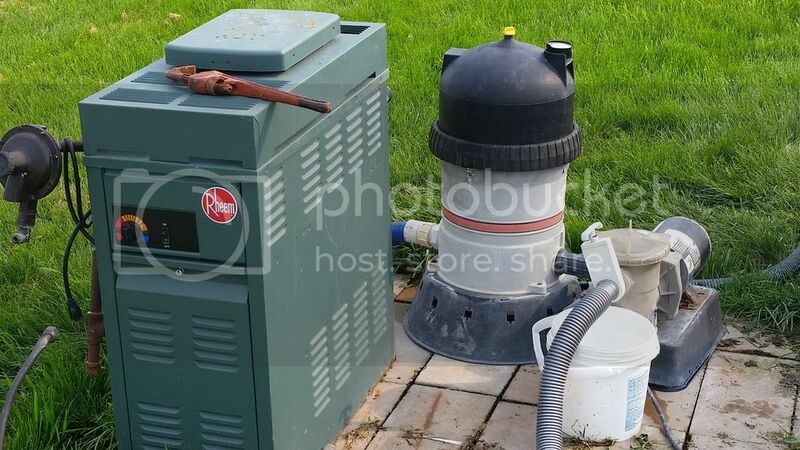 well I started to get the setup outside but after hooking everything up the basket area of the pump (sorry, not good on terms) is shot, the previous owner appeared to try and repair a leak with some special tape, but it looks like it finally has given away. I wonder if thats why I had suction issues as I can see water all over the place now, it wasn't like this before. I guess I need to see if you can use a 1.5 HP pump on a cartridge filter I have as I see a good deal on a dual speed one. For the money I figure worth a try, plus, could get it here by tomorrow. Right now, just scraping up what I can from the pool and brushing it around to keep the water circulating some till it comes. Ended getting this hooked up. I had to get a local pool stored to make me some of the hose lines as it is not compatible by with the Splashpak filter but it works like a charm now. No leaks like I had before. I may even remove the slice shutoff gate as that is the only thing that has a tiny drip when the pump is completely off. And I may get some new lines. So far so good with the pump, works quite well and is VERY quiet.